CarLy Haney's eight-legged art isn't meant to frighten. Halfway up CarLy Haney's cozy living room wall, "Nikkoli" perches in a frozen pose. Stretching out from a 2-inch-long abdomen, his spindly legs delicately rest atop an eggshell-white crocheted doily inside a deep mahogany frame. The large Nephila spider has been dead for who knows how long, but now it rests in peace as a prized specimen, joined in a display here by two of its macabre brethren, a pair of equally massive and magnificent hair-covered tarantulae. While certainly not everyone's first choice of home décor, the statement-making specimens are not without a niche following, from both faraway and local collectors. Haney estimates she's made and sold nearly 60 of the taxidermied mounts since she began back in 2014. Even modest arachnophobes, who may shudder as they compliment Haney on her lack of fear and eye for detail, often appreciate seeing these natural wonders of the animal kingdom up close. "Part of the reason I do this is to meet like-minded people," Haney reflects. "You grow up thinking you're really weird, and then you have a booth at Bazaar [an annual Spokane arts fair] and all these people are like, 'I love this,' and you make new friends immediately. It's fun to hear people who don't like it as much say, 'You know, I hate spiders, but this is really beautiful.' I want to take something you wouldn't necessarily think that about and put them in that light." Still, a fair number of people who encounter her art, which has been displayed at various bars, retailers and arts events locally over the years, can't force themselves to look. "I don't think there is really any other art that has that kind of impact on people," Haney notes. "It's very in-your-face with what it's about. I like it." 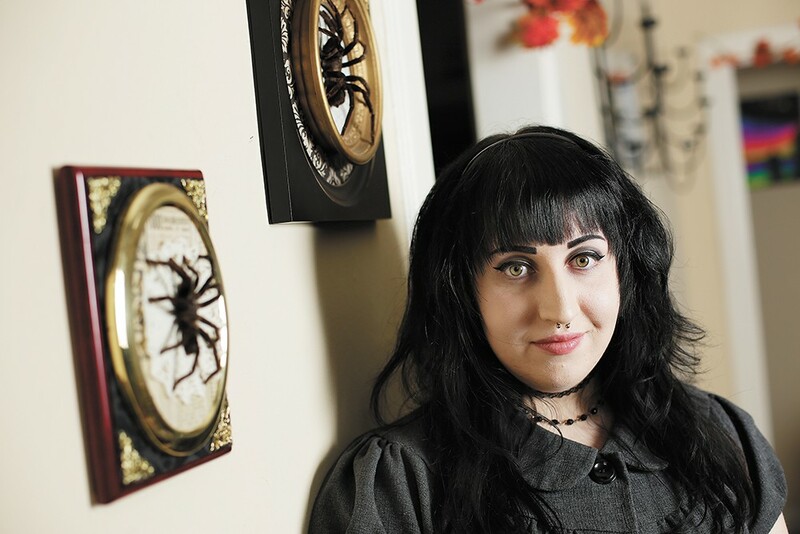 The 26-year-old artist firmly believes that the giant spiders of the world she works with, mostly native to warmer climates in Asia and South America, and which are nearly harmless to humankind, are widely misunderstood. "When I think of spiders, I think of them crawling around and being scary. But seeing them in a frame and getting up close — and not putting them behind glass like scary prisoners — you can touch them, and they're tiny animals," she says. "I don't really do this for a statement, but if I had a statement, it would be that; for people to try to see something normally perceived as ugly, [as] regal and pretty." Despite this sincere admiration of her art's subjects, Haney admits she's not a fan of the Inland Northwest's comparably small arachnids that often creep indoors, hiding in piles of laundry or scuttling up the wall. "There's a tiny one living in my bathroom that doesn't scare me, but if I see them outside, I don't touch them," she confesses. "I am afraid of spiders still. They scare me, and I think that's part of why I do this." Most of the spiders Haney works with are ethically sourced from online distributors who ship the specimens nearly ready to mount, meaning they've been gutted and stuffed with cotton. The spiders' hard exoskeletons make taxidermy fairly easy; after Haney receives a specimen in the mail, she has to gradually rehydrate the corpse by wrapping it in a damp paper towel before she can re-pose the legs into a natural-looking state. Most of the spiders she works with are species of Nephila (her favorite), a giant orb-weaving genus, much like a common garden spider, or hair-covered tarantula. Once a specimen has been ever-so-carefully posed and pinned onto a bed of Styrofoam, Haney selects a frame that complements the creature's shape, size and coloring. The artist constantly collects frames, vintage doilies and craft paper to use in the assemblages, which all tend to evoke a gothic Victorian or elegant baroque theme. One feature that perhaps sets them most apart from other small-animal taxidermy displays is that Haney's spiders are exposed to the air, not set behind glass or in shadow boxes. This makes the pieces incredibly delicate (she always brings a glue gun to events), and also allows the viewer to see the spiders at all angles. For this reason, Haney won't ship most of her spider pieces; the chances of them arriving smashed in pieces are too high. Interested local buyers can find her latest named specimens, including Nikkoli, for sale online in her Etsy shop, and occasionally at venues around town. (Currently, she has some hanging downtown at Boo Radley's and Giant Nerd Books, and the new Sticks and Dreams: Gallery & Emporium on Garland.) Haney frequently posts photos of her new creations on social media using the hashtag #carlysspiders. Most of the ready-made mounts are priced between $60 and $100.